Bill Belichick’s Patriots won't pick in the first round of the 2016 draft due to sanctions handed down by Roger Goodell after Deflategate. Scouting combine and retirement news coming in this column, plus the Gospel According to Mayock. But first my take on the dormant story that needs to come alive, and soon. It’s been nine months since commissioner Roger Goodell suspended Tom Brady four games, fined the Patriots $1 million and took away a first-round pick in the 2016 draft and a fourth-round pick in 2017 for the deflated footballs incident at the 2014 AFC Championship Game. The story will be back in the news next week, when the NFL’s appeal of the smackdown of the Brady suspension will be heard in a New York courtroom. But the effect of the case will be felt in Indianapolis this week, when the New England Patriots’ delegation arrives for the combine missing something invaluable to the care and feeding of NFL franchises. Namely, the 29th pick in this draft, docked from the Patriots by Goodell. This leaves New England with no draft picks in the top 59 of an above-average draft. No one has really focused recently on the enormity of the draft-pick sanction. Last year, with the 32nd and 131st picks (the 2017 fourth-rounder likely will be around No. 130 overall), the Patriots took two players (Malcom Brown and Shaq Mason) who started in the AFC title game—two of 22 starters in their biggest game of the year. Based on the weight of the evidence from the past 13 months, and that weight being circumstantial and not convincing, there’s one conclusion I’ve reached entering the 2016 draft season: Roger Goodell needs to give back the picks. Whatever happens in the appeal of the case—which isn’t centered on the Patriots’ guilt or innocence but rather on a point of labor law in the judge’s decision—Goodell needs to realize he acted without nearly enough scientific evidence against the Patriots. The NFL has some significant circumstantial evidence in the case, the kind that should have prompted a strongly worded letter and $250,000 fine. Instead, Goodell killed an ant with a sledgehammer. The only thing that would have changed my opinion on the evidence in this case is if the NFL measured the footballs before, at halftime and after all 267 regular-season and post-season games—not just selected games, which is what the league did. The NFL needed to find out what weather and precipitation and humidity and hot air and frigid air did to footballs, to see if the league’s questionable science in the Wells Report stood the test of an NFL season. The NFL doesn’t have that data because it never administered such tests. The Patriots case cried out for the league to do it this season. The fact that the NFL did so only in scattered games (according to Goodell) simply to ensure no team was cheating this year is stupid; it tells the world the league never wanted to find out the effect of weather on footballs. Was it reasonable for footballs to lose 1.2 pounds per square inch in inclement weather, which is what New England’s footballs did that January day in Foxboro? Or would footballs in a similar environment lose far less pressure? Goodell and the NFL don’t want to know the answers. There’s a lot of circumstantial evidence against New England. Patriots locker room attendant Jim McNally disappearing with the footballs before the AFC Championship Game for 100 seconds was wrong, and shady. McNally and team equipment assistant John Jastremski being held back from an additional interview with the Wells investigators was wrong. The six phone calls, once the NFL announced it would investigate whether the balls were deflated, from Brady to Jastremski when they rarely ever spoke on the phone doesn’t quite stink, but it’s got an odor to it. McNally calling himself “the deflator” in a May 2014 text is a bad look. Tom Brady’s career numbers reveal no stark contrast between home games and away. 1. Referee Walt Anderson skates, and never should have. The Wells Report notes that Anderson, in the officials’ locker room before the game, got distracted and angry that the bag of game footballs had been taken from the room. In the 19 years Anderson had worked games, Wells reported, Anderson never lost control of the footballs before a game. This was a particularly egregious gaffe by Anderson, seeing that a league official had warned the officials before the game to be on the lookout for funny business with the footballs. This, in legal terms, is losing the integrity of the evidence. What would happen in the real world if a police officer didn’t follow proper protocol and lost crucial evidence to a case for eight or 10 minutes, during which time the evidence could be doctored? The case would be thrown out of court. The footballs were out of sight, and the league put the full blame for it on McNally and none of the blame on Anderson. The referee in the AFC Championship Game lost track of the footballs, and the NFL chose not to make it a factor—apparently because of Anderson’s pristine reputation—in its ruling. It should have been a factor, and a big one. 2. The Ideal Gas Law was abused in the Wells Report. On page 113 of the Wells Report, after a description of the scientific Ideal Gas Law, Wells wrote that the Patriots footballs should have measured between 11.32 psi and 11.52 psi. The 11 footballs that were measured at halftime of the championship game were measured on two gauges. The average of all 22 readings was 11.30 psi … 0.02 lower than what the league’s Ideal Gas Law science would have allowed for balls that started the day at the Patriots’ level of 12.5 psi. A couple of points here: The exact measurements of the footballs before the game were never written down. And there’s no indication that the measurement of footballs before games has been an exact science. I witnessed one such measurement in 2013, before the Baltimore-Chicago game, and official Wayne Mackie at one point stuck a needle in a football that was supposed to be at 12.5 psi. He measured and said, “Twelve and a half, close enough.” What does that mean? Was it 12.36, or 12.62, or something other than exactly 12.50? Regardless, no judge anywhere would bring the hammer down on a situation like this—inexact measurement before the game, an allowance of the footballs to be 11.32 psi, and the balls found at 11.30, on average. The NFL could have found out the truth this season and chose not to. 3. Did Tom Brady gain an advantage this year, presumably when the footballs every week exited the officials locker room in Foxboro at 12.5 psi? The home locker-room attendants do not travel, leading a suspicious mind to think that since no home-team employee touches a football once it’s been delivered to an officiating crew on the road, it’s only at home that the footballs could be tampered. Brady’s home passer rating this year: 102.0. Brady’s road passer rating this year: 102.4. 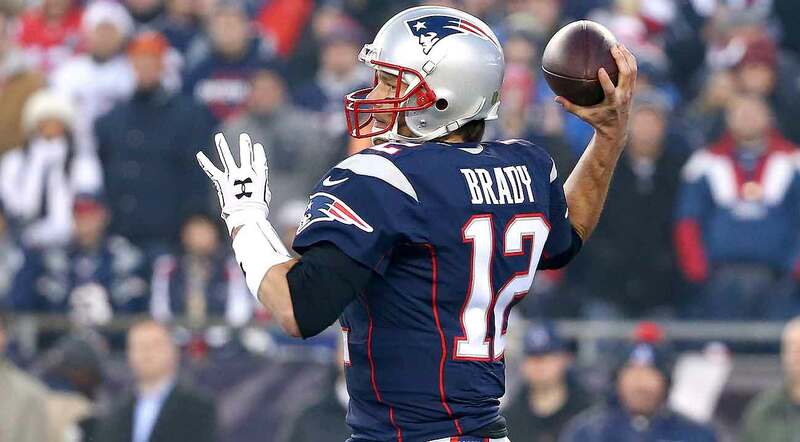 At home this season, Brady threw 20 touchdown passes and four interceptions. On the road, it was 16 touchdowns and three interceptions. Nothing new about that, really. In the past 10 years, Brady’s had a home passer rating of 100.4 and a road rating of 100.0. Negligible. I don’t expect Goodell to set the precedent of revisiting a sanction, especially at a time when the league will push hard to overturn Judge Richard Berman’s verdict setting aside Brady’s suspension when the case is heard in the U.S. Court of Appeals for the Second Circuit beginning next week. But just because the league won’t do it doesn’t mean we should forget it, or stop pointing out the errors that resulted in this discipline run amok, or point out that Goodell should do the right thing. The Patriots deserved to be slapped for Deflategate, not crushed. In fact, I'd propose giving back the draft picks but keeping in place the $1 million fine. These were reactionary, overblown sanctions. With time to reflect, they look even worse than when they were levied last May. Owners in the NFL appreciate Goodell’s ability to look at complex issues and come up with solutions that are good for at least a majority of the franchises. You might argue in this case that Goodell had 31 other owners cheering him on, and rooting for him to smite the mighty Patriots. But I wonder how those powerful titans of business and their top club officials—one of whom told me last spring he felt the sanctions were “draconian”—would feel if the type of evidence used to slap down the Patriots and their quarterback was used against them one day. Goodell admitted his error with Ray Rice in 2014, and was wounded by it. He can admit an error again, and should, because it’s the right thing to do. He should give the draft picks back to New England. Noah Spence, who was dismissed from Ohio State and spent last season with Eastern Kentucky, has drawn comparisons to Von Miller for his pass-rushing skills. Time to vastly overrate NFL draft prospects! That’s what happens when 32 NFL teams gather with their shopping lists, and 1,150 members of the news media are on hand to document the running and the testing and the interviewing of 335 top NFL prospects for the 2016 draft. That’s about three media people and two coaches/scouts/club officials per prospect. 2. The two biggest mystery guys? Two huge front-seven prospects. Mississippi defensive lineman Robert Nkemdiche fell from a fourth-floor window of a Hyatt in Atlanta in December, and police found seven marijuana cigarettes in his hotel room, leading him to be suspended for Ole Miss’s bowl game. So there’s that. “If you watched his Alabama tape from this year and we lived in a vacuum with no concerns for off-the-field stuff, you’d think he could be the first player picked in the draft,” said Mayock. Then there’s defensive end Noah Spence, booted out of Ohio State for failing multiple drug tests, including one for ecstasy; he transferred to Eastern Kentucky and had 11.5 sacks last fall in his only season there. “One of the most talented kids in the draft,” said Mayock, “but obviously, you’ve got to be careful.” Spence is similar in size (6-2 5/8, 252 pounds) to Von Miller. 3. Rising defensive star? Sheldon Rankins. “He made one of the great plays I’ve seen on tape this year—a scoop-and-score against Boston College,” said Mayock. “But not only that, he made a move on a BC guy while he’s finishing picking up the ball. He’s one of the great three-technique prospects in the draft this year, and he’s played all over the line. His value’s really going up.” Mayock says Oregon’s DeForest Buckner, a tackle or end, will be a certain top-10 pick. 7. How many quarterbacks in the first round? Those three, probably, plus maybe Connor Cook of Michigan State. Enigma, as you’ll hear this week. Many love him, some question his leadership and consistency. “Cook’s a distant fourth in that group right now,” said Mayock. 9. Most telling line from Mayock: “It’ll be really interesting to see if Hackenberg gets past Bill O’Brien in the second round.” The Texans coach loved Hackenberg at Penn State, and Hackenberg basically fell of a cliff since O’Brien left. 10. Most interesting player at the combine? Could well by Penn State pass rusher Carl Nassib, the younger brother of Giants backup quarterback Ryan Nassib. Carl Nassib was not a starting player in high school, walked on at Penn State, didn’t start a game till this year, and ended up leading the nation in sacks. He had 15.5 sacks. Mayock says he reminds him a little of Jared Allen—the effort and the production and the love of the game. Calvin Johnson is contemplating retirement after completing his ninth season with the Lions. Peyton Manning, quarterback. Manning would retire with a 111-touchdown-pass lead on the all-time list over Tom Brady and Drew Brees (539 for Manning, 428 for Brees and Brady), and 21 more than second-place Brett Favre. Brady or Brees or both could break his records, but Manning’s place in Canton was assured long ago. The Knoxville events, regardless how ugly they get, will not affect that. Charles Woodson, defensive back. What a career. From Mr. Football in Ohio as a running back in 1994, to winning the Heisman Trophy as a defensive back and sometimes wide receiver at Michigan, to intercepting quarterbacks ranging from Warren Moon to Cam Newton as a cornerback and safety for the Raiders and Packers, finishing fifth all-time with 65 picks. Rodney Harrison, a fellow Pro Bowl safety, believes he’s the best defensive back in NFL history. 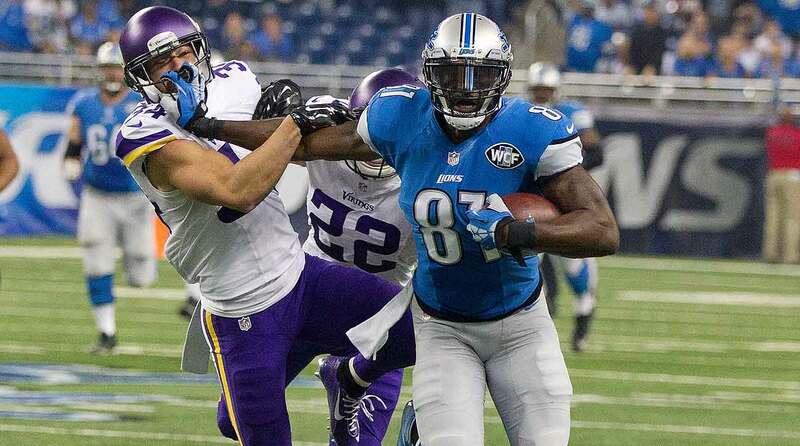 Calvin Johnson, wide receiver. If a receiver today had 3,645 yards receiving over three years, you’d say he’d be a Pro Bowler in two or three of those years. Johnson had 3,645 over two years, 2011 and 2012. He averaged 114 yards receiving per game over two seasons. I believe he’s the most physically imposing wide receiver I’ve covered. Voters will point out his relatively low 731 catches, and his nine seasons, which is fair. But I think he was pretty great for nine years. You know what’s interesting? We think of Johnson being so diminished as a player the past two years. Consider this: Receiving yards over the past two seasons—Calvin Johnson 2,291, Larry Fitzgerald 1,999. Jared Allen, defensive end. Allen will be an interesting call. He’s tied for ninth on the all-time sack list (an official stat only for the past 34 years), but does have 16.5 more than Dwight Freeney, 29.5 more than Terrell Suggs. In his prime he was the Tasmanian devil of pass-rushers, and I think he’s going to have a solid if not no-doubt case. Marshawn Lynch, running back. He retires 93 yards behind Ahman Green on the all-time list (Lynch is 36th, with 9,112, and he’ll be passed by a bunch of backs before becoming eligible), but his case is complex. This is going to be one of those players for whom the voters will have to use the eye test. More than any single person (including Russell Wilson, though it was close in 2013), Lynch ran the Seahawks to greatness. His bruising physicality as a back, at a time when so many teams were going to two alternating rushers to save the wear and tear, should be the trademark attribute we remember about Lynch. Jerod Mayo, linebacker. The 2008 Defensive Rookie of the Year averaged 118.5 tackles per season in his first five Patriot years, and was a leader from nearly the time he stepped on campus in Foxboro. Justin Tuck, defensive end. Only player in NFL history to have multiple sacks in two Super Bowls. He sacked Tom Brady twice in each Giant win over New England. As quick and powerful and versatile as any Giants lineman this century, other than Michael Strahan. Heath Miller, tight end. The perfect Steeler—strong, silent, missed but eight games to injury in 11 years—finished his career the all-time franchise tight end leader in catches (592), yards (6,569) and touchdowns (45). Those are going to be some size 35s to fill. Man, that’s a lot of greatness leaving the NFL in one month or so, assuming we’ve seen the last of Manning and Johnson. My annual combine tweetup will be Friday, 7 p.m., at Sun King Brewery in Indianapolis. You’ll love Sun King. It’s the coolest spot, a few blocks east of downtown. Not sure yet of our full lineup for the evening, but I do know it’ll include a few of my besties—Matthew Berry, the fantasy guy; Jenny Vrentas and Robert Mays of The MMQB; and a few others from the media world—who will answer all of your questions about life, the NFL, the draft, and whatever else that might come up. Tickets are $10, and you can find out further info by emailing our invaluable Indy correspondent and event organizer, Angie Six. Or just go here to purchase tickets. See you Friday evening at 7. If you’re lucky, I’ll let you buy me a Sun King Cream Ale. 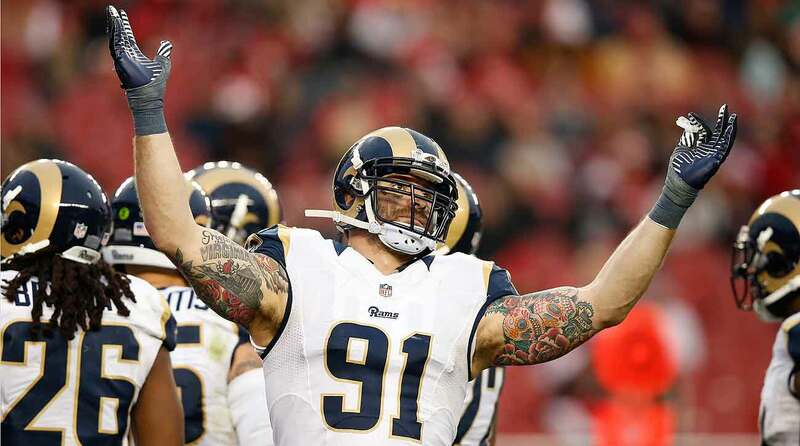 Chris Long, the No. 2 pick in the 2008 draft, started only 11 games for the Rams over the past two seasons. —Joe Gibbs Racing owner Joe Gibbs, after Denny Hamlin ended the former NFL coach’s 23-year drought at the Daytona 500 in one of NASCAR’s most exciting finishes ever. (Hamlin edged Martin Truex by 0.01 seconds in a photo finish.) Gibbs, who won three Super Bowls with Washington, last won Daytona with Dale Jarrett in 1993. —Defensive end Chris Long, on Instagram, after being cut by the Rams in a salary-cap move on Friday. —Steelers president Art Rooney II, on the retirement of the best tight end in Steelers history, Heath Miller, on Friday. —Steelers coach Mike Tomlin, to Steelers.com, on Heath Miller. —New Tennessee GM Jon Robinson, at a Titans event for fans in Nashville last week, on the prospect of trading or keeping the No. 1 overall pick in the April draft. —Agent Leigh Steinberg, on admitting in 2010 that he was an alcoholic and what motivated him to do something about it, to Jenny Vrentas of The MMQB in her “Talking Football” column on Friday. —San Antonio Spurs coach Gregg Popovich, on what he looks for in employees of the Spurs, on and off the court. Lots of good lessons in there for anyone in sports, anyone in business, and, really, anyone in life. 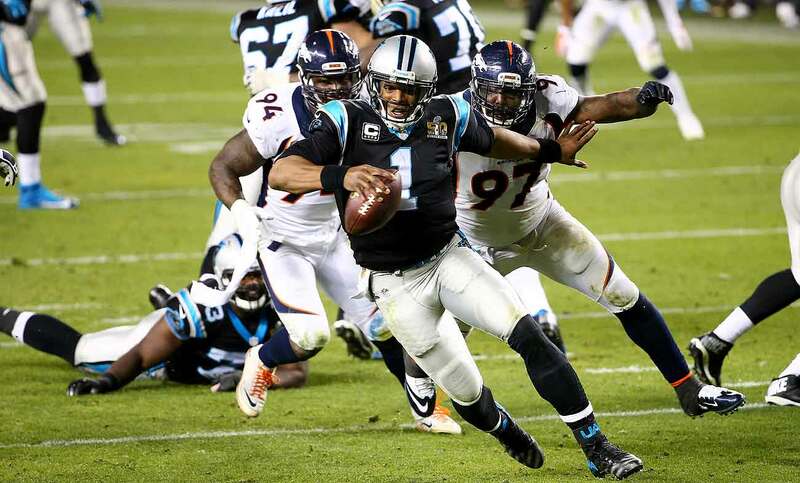 DeMarcus Ware (94), Malik Jackson and the Broncos defense made life miserable for Cam Newton in Super Bowl 50. Two notes about perspective and the Denver Broncos. Hard to argue against those who say the ’85 Bears and 2000 Ravens are the best defenses of recent vintage. The Bears allowed 3.3 points per game, Baltimore 5.8. But no team had to face the reigning MVP quarterback and two others with a combined six Super Bowl victories, so you could say, quite justifiably, that no team of those six had a tougher road to a title. Three premier quarterbacks faced, one touchdown pass allowed in 12 quarters—the desperation throw on fourth down by Tom Brady to Rob Gronkowski in the AFC title game. All told, an interesting comparison. Second: The Denver offense had an awful postseason. How awful? The Broncos averaged 3.97 yards per offensive play in the three-game playoff run to the championship. The worst team in the regular season in yards per play, Indianapolis, averaged 4.89. So, on average, the Broncos were a yard worse than the lowest-functioning offensive team in the regular season. What may be even more startling is that in none of the three playoff games did Denver average in a game what the worst offensive team averaged per play over the 2015 season. Compared to Indy’s 4.89 yards per play, the Broncos were 4.56 yards per play against Pittsburgh, 3.75 against New England and 3.46 against Carolina. Taken together, those two stats do not prove the 2015 Broncos had the best defense of any Super Bowl team of the past three decades. But they should convince you that they had a pretty great run. Jared Allen can ride off into the sunset (which he sort of did in making his retirement announcement on Twitter, riding off on horseback under an overcast western sky) knowing he was a pretty good football player in his day. • In his best five consecutive seasons for sacks (2007-2011), Allen had 77.5. • In his best five consecutive seasons for sacks (1985-1989), Lawrence Taylor, considered by many the great defensive player ever, had 76. • In his best five consecutive seasons for sacks (1986-1990), Bruce Smith, the all-time sack leader, had 70. Kudos, Delta, for rushing my wife and me onto a Raleigh-to-LaGuardia flight last week during some nasty weather in both North Carolina and New York City. We were due to fly at 7 p.m., but the two caring counter agents saw which way the wind was blowing (not to mention the freezing rain) and deduced that if we didn’t get out soon, we probably wouldn’t get out at all that day. We got the last two seats on the 2:10 nonstop to New York … and though we sat until 5:50 waiting out New York weather, we got home. When aboard the plane, I noticed the last two flights of the day to New York, including the one we originally booked, were canceled. In cases like this, the agents at the counter don’t know the flights are going to get canceled, but they can look outside and see the weather and look at Air Traffic Control and see all the delays and cancellations on the East Coast, and they can do one of two things: push paper and send us through security to wait for our 7 p.m. plane, knowing there’s a good chance it will either be delayed for hours or never go; or they can be nice and considerate and notice there are two seats on the plane about to leave and ask if we want them and if we hurry to the gate we could probably make it. I wish I got their names. They deserve credit for being good at their jobs, and good people. The Jaguars defensive tackle tweeted this after seeing Goodell’s 2014 compensation package of $34.5 million, putting him over $180 million for the first nine years of his tenure as commissioner. Having spent much of the week in Philadelphia talking w multiple sources, this does not have the look/feel of open-shut case v LeSean McCoy. The Buffalo News writer, on the investigation into assault charges against the Buffalo running back by the Philadelphia district attorney. On Friday the DA said the investigation continued into the altercation involving McCoy that left one off-duty police officer injured. Gase takes over a Miami team that hasn’t made the playoffs since the 2008 season. 1. 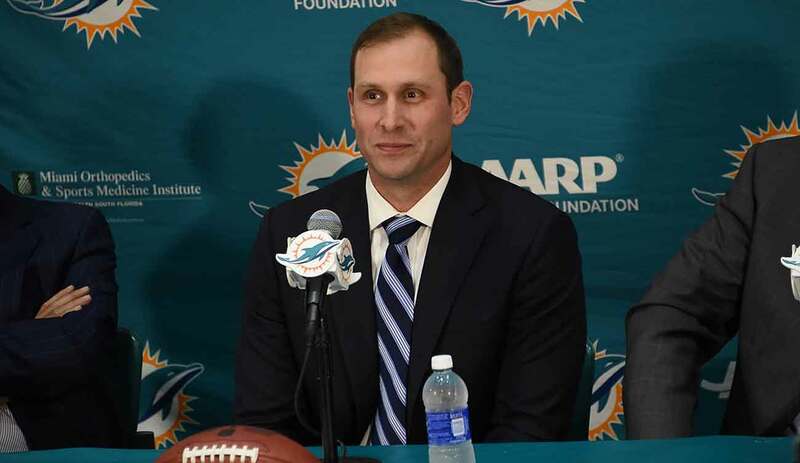 I think I was like everyone else when I heard Dolphins owner Stephen Ross’s words the other day that seemed to say he’d be getting rid of new coach Adam Gase after three years if the team hadn’t made the playoffs by then. This was how I felt: You don’t need to put a time limit on anything; it’s an unnecessary deadline. It’ll be evident at the end of three years whether Gase is your long-term coach. Tom Landry was 9-28-3 after his first three seasons with the Cowboys. Chuck Noll was 12-30 after three years with the Steelers. So don’t make a judgment until you have to. So I was critical of Ross when I wrote this item originally over the weekend. But what Ross actually said is something pointed out to me this morning: ”Every year, there's anywhere from six to eight coaches. It’s the most objective thing in the world. Everybody looks at their won-loss records. There's no other excuses. So, every team, after three years, if we haven't made the playoffs, we're looking for a head coach. That's just the way it is. The fans want it.” So, Ross didn’t say he would do it. He said that’s the environment that exists in the NFL. Now, this isn’t to say he won’t pull the trigger after three years. But he didn’t say it exactly that way in Florida last week. Now it’s up to Ross to have the kind of patience a good owner needs if Gase is showing signs of being a strong long-term head coach after three years—but hasn’t made the playoffs. 2. I think it should be fairly obvious why the Rams whacked three respected veterans—Chris Long, James Laurinaitis and Jared Cook—on Friday. It created $23 million in cap space for the team, and though all three at their best are valuable players, Cook hadn’t produced the way the Rams thought a top-tier tight end should; Long has been hurt for most of the past two years; and there was a slightly more complicated issue with Laurinaitis. The Rams intend to move Alec Ogletree, the first-round pick from 2013, into the nerve center of their defense—the spot Laurinaitis occupied—because they think Ogletree can be more of a playmaker there than Laurinaitis. Now, the one regret the Rams may have is in the next year or two is Long. Though he turns 31 next month, Long will be pursued aggressively by contenders (it’s already happening), because he can be signed before the start of free agency. Not sure he will sign quickly, though. He and his wife are expecting their first child in the coming weeks. 3. I think, regarding Roger Goodell’s $34.1 million salary and benefits from 2014, which was made public last week, I maintain that if a group of owners is willing to pay Goodell, essentially, $1.07 million per team, that’s their business. And it’s probably not out of line with the owners’ valuation of what he is worth to them. But it’s just tone deaf. I don’t know why a smart man like Goodell can’t see that $34.1 million in salary and benefits just turns haters into detestors. Goodell, $34.1 million. Best player in 2014, Tom Brady, $14.8 million in pro-rated bonus and salary. Head-shaking. 4. I think I see Malik Jackson going to the highest bidder in free agency. And I am beginning to be dubious about whether that will be Denver. The Broncos will keep Derek Wolfe, DeMarcus Ware and Von Miller (with at least the franchise tag) this free-agency season. The fourth pass-rusher, Jackson, might be too much for John Elway’s cap to take. I do believe someone (Giants? Falcons?) will pay Jackson $12 million a year, and that could be too rich for Denver. 5. I think I’d put the odds at 55-45 that Tom Coughlin gets hired, at 70, to coach an NFL team in 2017 … and 80-20 that Coughlin will want a job 11 months from now. 6. I think maybe sports ownership just isn’t the way to go for Randy Lerner. The former Browns owner—he sold to Jimmy Haslam in mid-2012—is trying to unload his English soccer team, Aston Villa, which sits in last place in the Premier League. It’s understandable why Lerner would want to sell. In the past four seasons, Aston Villa has 33 wins, 73 losses and 34 ties, and this year it faces near-certain relegation, the process by which the bottom three teams get demoted and the top three teams in the lower league move up for the following season. Aston Villa has never won more than 10 of 38 games over the past four seasons, which is abysmal. In his last four years owning the Browns, Lerner’s teams were 18-46. 7. I think it’s essential you read this on Scott Norwood from Tim Graham of the Buffalo News if you have any regard for those great Bills’ teams of a quarter-century ago (yes, it’s been that long since Norwood was wide right by 15 inches against the Giants in the Super Bowl). On missing the kick that would have beaten the Giants, an emotional Norwood told Graham: “It’s still very fresh, very real. I get emotional. It’s like when I think about my parents and when they died. People always say time will take care of that. I don’t think it really does.” When Bruce Smith was told of the emotional hold that the kick still has on Norwood, he told Graham it was the work of Satan. Pretty powerful stuff. 8. I think, in the wake of Randy Gregory being suspended for the first four games of the 2016 season (substance abuse), I don’t know how Jerry Jones could strongly consider signing Johnny Manziel this off-season. Jones just has too many players with off-field concerns on his team. Aside from the fact that Manziel appears to need significant counseling and addiction assistance that should wipe out his 2016 season, there’s no guarantee his upside as a player makes him any lock to be a good NFL quarterback. If I were Jones, I’d steer toward Robert Griffin III. 9. I think this is more than just a cool remembrance of the 2003 combine by Rick Gosselin. It’s a good example of how you need a complete picture of a prospect when you’re judging him, and how easy it is to let a good player slip through the cracks—in this case, Tony Romo, because he went to Eastern Illinois. a. RIP, Harper Lee, author of To Kill a Mockingbird. She died in her sleep Friday at 89. Just imagine writing a first book and selling 40 million copies … in essence, having the book in the homes of one out of three families in the United States. Library Journal, in the ’90s, called To Kill a Mockingbird the best novel of the 20th century. Such a great story about race and injustice and children and an inspiring lawyer in an Alabama town. The fact that the book is 55 years old should not diminish its impact. It was important then, and it’s important now. b. Great job by Liz Clarke of the Washington Post, recalling the death of Dale Earnhardt and humanizing him so perfectly 15 years after his death at Daytona. d. Perhaps a more interesting story, about what the world is becoming: an economy of shut-ins, by writer Lauren Smiley. f. Saw Michael Moore’s latest film the other day, Where To Invade Next. I enjoy his movies, which is not to say I agree with everything he makes or says. But this one’s a gem. Moore goes to a slew of different countries, from Norway to Tunisia, and hits nerves on what we should do better in the United States. Moore goes from land to land and takes a moral-of-the-story from each, hitting on themes about how Moore believes America can improve—treat women better, give women more authority, have more humane prisons, stop saddling college students with massive debt, cut down standardized testing. The best thing, and a fairly emotional telling, happened in Germany. Whereas in teaching our children in history classes we play down slavery and other embarrassing American historical verities, Germany teaches and emphasizes the Holocaust in schools and with landmarks such as the erection of house signs where Jewish families once lived before they were led to their deaths in concentration camps. It’s a way to teach the young that this can never happen again. The movie makes you think, a good way to spend two hours. g. USA Today projected the Major League Baseball standings the other day, and picked no team in the American League to win more than 90 games. Hmmm. I’d take that bet—that at least one team, and probably four, will win more than 90.
h. Will also take the over on the Tigers (82), the over on the Royals (88), and the under on the Cubs (101). i. Coffeenerdness: Ground Central, with locations around Manhattan, takes such good care with its lattes. Had one the other day at the East 52nd Street location, and you can tell I’m not the only one with a liking for their stuff. At 3 p.m. the place was packed. Lots of worker bees and a few business meetings going on. j. Beernerdness: Had the Brooklyn Greenmarket Wheat (Brooklyn Brewery, Brooklyn, N.Y.), a Witbier chock-full of ingredients from New York state, including New York honey. A delicious and aromatic wheat beer, reminiscent a bit of Pyramid Hefeweizen—and that’s a big compliment. k. Good luck, Jim Leonhard, in your new gig as defensive backs coach at Wisconsin. Leonhard is one of the more underappreciated and versatile players I’ve covered in recent years. the scouting combine this week. I beg you: Do not.